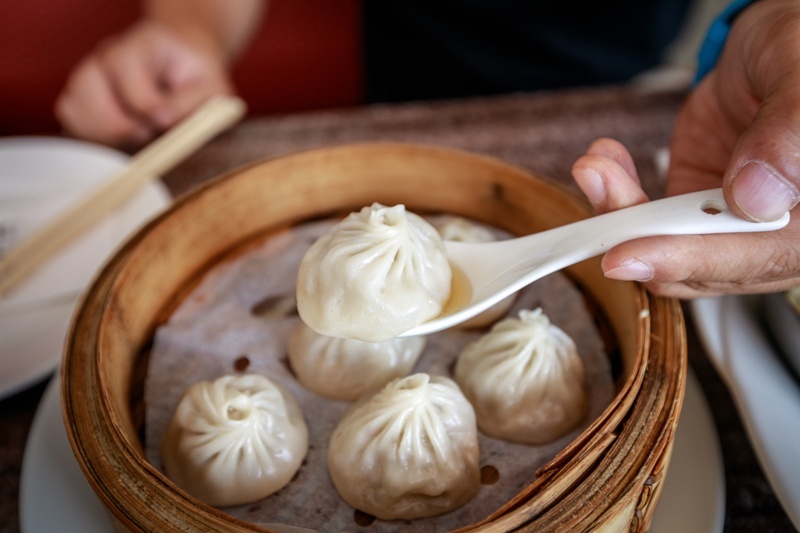 One of the region’s most famous dishes, xiaolongbao (or soup dumplings), can be spotted streetside in towers of steaming bamboo baskets. The thin dumpling wrapper encases minced pork and liquified pork gelatin. To eat, you dip the dumpling in rice vinegar steeped with ginger, then slurp out the piping hot pork soup carefully before you take a bite. But how do you make them? Read on below to find out the secrets (and shortcuts) to making these after you’ve tried them on our Shanghai Food Tours. 1. Combine all the filling ingredients except the jelly. Stir the mixture 50 times in one direction to eliminate any lumps. Now add the jelly, and mix. Refrigerate until ready. 2. To create the wrapper, combine the flour and water into a dough. Knead for 10 minutes until elastic. Divide dough into two equal pieces. Roll each piece into a 12 inch long cylinder. Separate each cylinder into 12 equal pieces. Roll each individual piece into a ball, then flatten into a disc. Roll out to 6cm size. 4. To cook the dumplings, line a steamer basket with a store-bought liner, or a piece of tea-towel cut to shape. This will stop the dumplings from sticking to the steamer bottom and tearing when you lift them out. Place the dumplings into the steamer without touching one another. Steam for 10 minutes. Serve immediately with a side of brown rice vinegar and sliced ginger. See below for a recipe shortcut if you don’t want to spend eight hours babysitting the aspic on the stovetop. 1. Remove all fat from the pork skin. Clean it carefully and remove all hair. Blanch skin to remove any impurities. Toss out the water used to blanch the skin. 2. Bring 4 liters of water to a rolling boil and add the pork skin, green onion, ginger and rice wine. Lower the heat and simmer covered until the pork skin is soft. Remove the pork skin and chop it roughly. Return it to the wok and simmer covered until the most of the skin is dissolved (you will still have a few small pieces in there) and the liquid is a milky color. This process takes about 6-7 hours and you will need to top up the water (with boiling water) to keep the level up. 3. Strain the water with a fine mesh strainer to remove all skin and remaining vegetables. Refrigerate the pork stock overnight. It should be a gelatin when you wake up in the morning. Remove any fat that has formed a layer on top of the gelatin. Chop the gelatin finely. It keeps for 2 days in the fridge or 2 months in the freezer.